Shown below is a simple piece that uses only the note E, the open first string of a guitar. While playing a single note over and over again may sound boring, hopefully the included audio part (found below the music) will make it more enjoyable. This piece was written to help imprint the note E in your memory, and to give you practice at playing different rhythms. While the whole piece uses the same note, first string open E, the rhythm changes in each line. Notice that the first measure of each line is a rest. If you listen to the audio file, you will notice that the first measure of each line (also called a "system") is played only by percussion. After you count "one, two, three, four" with the beat of the percussion, you will begin playing the guitar part, during which the accompaniment part will also include bass and strings. The second and following lines of music work the same way. Pluck notes when the counting numbers are underlined. 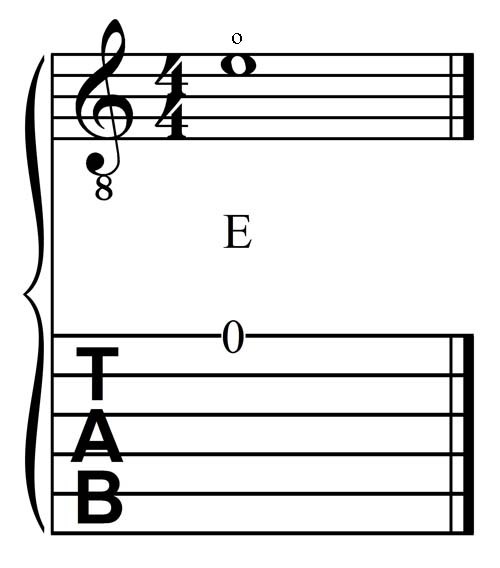 In the first line, since whole notes are plucked only once but last for four beats, only the number "1" is underlined. For the second line, the half notes are worth only two beats each, hence you pluck on the numbers "1" and "3", which are underlined. 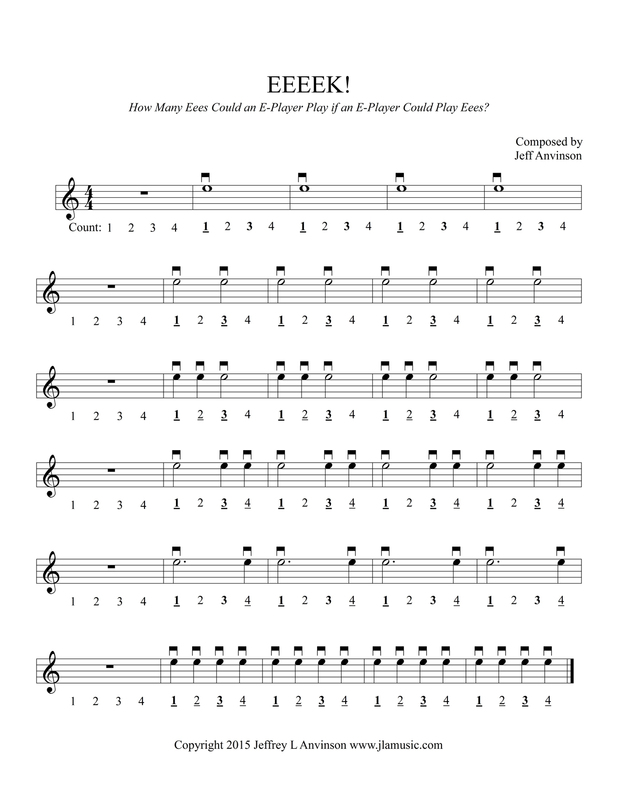 Each line of music works this way: You pluck when the counting numbers are underlined. Bold notes are plucked slightly louder than others, with the number "1" notes plucked the loudest and the number "3" notes plucked slightly softer. This is the natural rhythmic accent found in many compositions. It is the main reason we feel a group of four beats in each measure. If you are listening on a stereo sound player, the guitar part will be heard in the right channel and the accompaniment in the left channel. If you have a balance control, you can turn completely to the right or left to listen to just the guitar or accompaniment part. Despite its relative simplicity and repetitiveness, I hope it will serve to be a fun piece to play for anyone beginning to read notes for the guitar.